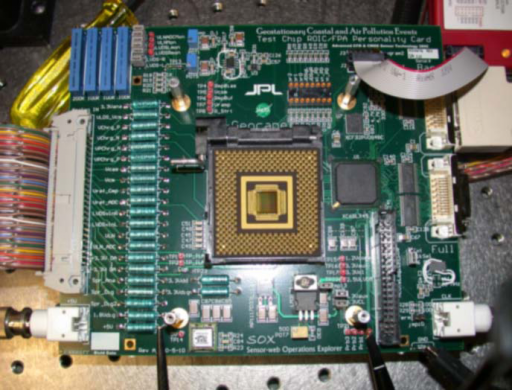 GRIFEX, the GEO-CAPE ROIC In-Flight Performance Experiment, is a 3-Unit CubeSat that hosts an engineering experiment setting out to demonstrate an all-digital in-pixel high frame rate Read-Out Integrated Circuit developed at the Jet Propulsion Laboratory. 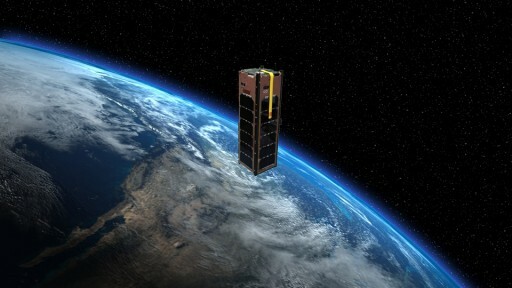 The high-throughput capacity of the ROIC will be demonstrated on this mission to validate a core concept of the proposed Geostationary Coastal and Air Pollution Events (GEO-CAPE) mission that aims to make hourly high spatial and spectral resolution measurements of rapidly changing atmospheric chemistry and pollution. The GRIFEX mission is funded by the Earth Science Technology Office at NASA to advance the technology that will be required for the future spaceborne measurement of atmospheric composition from Geostationary Orbit which is relevant to climate research. It will also benefit missions that require advanced detectors. 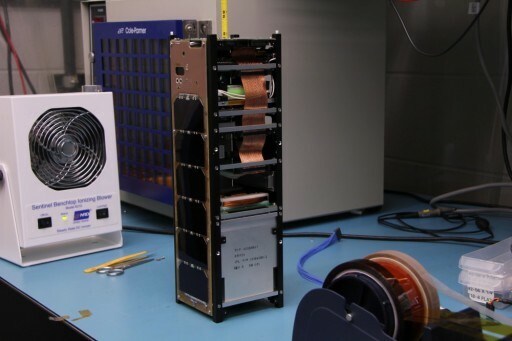 The detector technology demonstrated by GRIFEX will be flown in the Panchromatic Fourier Transform Spectrometer, an imaging FTS designed to operate from Geostationary Orbit. The GRIFEX satellite will demonstrate the digital focal plane assembly and signal chain technology for the operational PanFTS instrument. PanFTS will measure a wide range of trace gases with unprecedented vertical resolution being sensitive in the UV, visible and infrared wavelengths covering a spectral range of 260 to 3,500 nanometers with a ground resolution of 4 by 4 Kilometers and a repeat cycle of one to two hours. These measurements will support modeling of chemistry transport, monitoring of pollutants and trace gases, assessments of ozone and aerosols and a number of other relevant parameters. The PanFTS instrument combines a conventional Michelson Interferometer with several unique features, making use of spectrometer technology developed for different missions such as the Tropospheric Emission Spectrometer, the Orbiting Carbon Observatory and the Ozone Monitoring Instrument. PanFTS has two optical paths that are operated in parallel – one for the infrared wavelengths and one covering the UV and visible spectral range. The instrument has a five-centimeter beam aperture and all structures are kept at a temperature of 180K to make the self-emission from the instrument negligible. The optical design of the instrument is kept compact by using a common set of fore optics, a single common interferometer and an optical path difference mechanism (OPDM) and metrology laser system plus other instrument along with line-of-sight pointing mirror, the data management system, thermal control system, electrical system, and the mechanical structure. The light entering the instrument arrives at a two-axis gimbaled line-of-sight selection mechanism that directs two parallel 5-centimeter optical beams that then share the magnification foreoptics – the two beams never overlap in the process and all mirrors in the IR path use a gold coating while the UV/Vis path uses an UV enhanced aluminum coating. After passing through the optical system that includes a field stop, the light is passed into the respective sides of the interferometer by a set of folding mirrors. 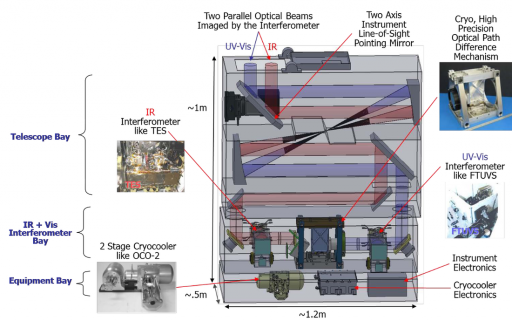 The interferometer is optimized for each spectral domain, including the necessary mirrors and beam splitters to create the interference patterns for both beams that use independent Focal Plane Assemblies for detection of the collimated, interferometrically-modulated radiation. The visible channel employs a 128 x 128 pixel detector system with an on-chip two-stage sigma-delta analog-to-digital converter for each pixel that share a common clock for a simultaneous read-out. 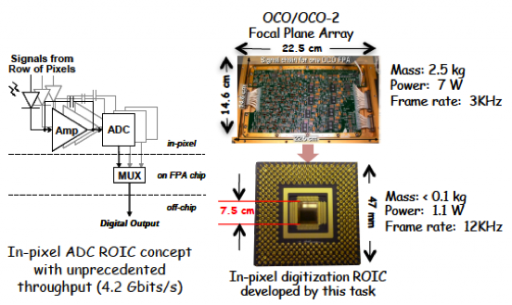 The fast readout integrated circuit (ROIC) uses CMOS technology (Complementary metal-oxide-semiconductor) hybridized to a silicon PIN diode array using indium bump bonds. The pixels are 60 μm x 60 μm in size covering a 4 by 4 Kilometer ground area. 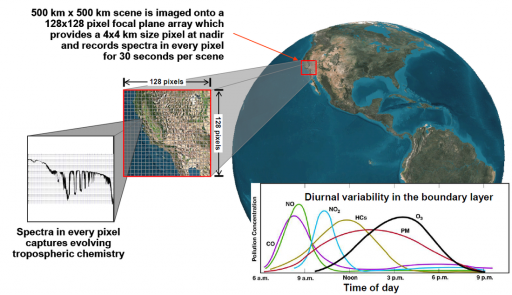 Spectra are recorded in every pixel for 60 seconds per scene. A frame rate of 14kHz with 8kHz bandwidth and 14-bit precision is easily achieved by the detector that only consumes 1.1 Watts of power. The ROIC system allows for an unprecedented data throughput of 4.2Gbit/s. The infrared detector consists of an indium-antimonide CMOS array with 256 by 256 pixels, commercially available from Raytheon. It achieves the required frame rate at lower spatial coverage using a windowed mode. 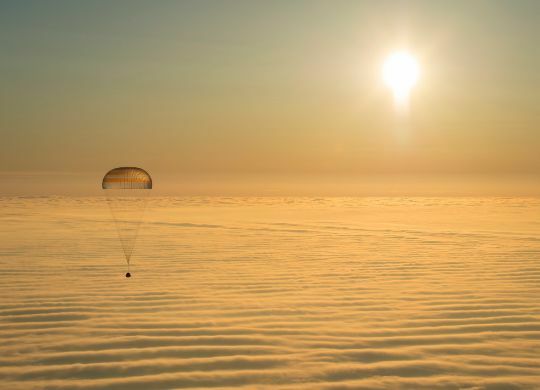 The purpose of the GRIFEX mission is to demonstrate the novel ROIC technology to be implemented in PanFTS to validate the performance of the system in the relevant space environment.